Anna-Sofie Hickson is a freelance writer with six years of writing experience. She writes for "LIVESTRONG Quarterly" magazine and contributes to various military publications. She is a certified personal trainer and holds a degree in English and psychology from Franciscan University. She is pursuing a Ph.D. in psychology from the University of Texas. Losing a spouse affects every aspect of your life and continues to affect you until you’ve allowed the intricate aspects of grief to take place. The anguish from the loss of a spouse manifests itself in many ways, including severe depression. Dealing with someone who’s experiencing the loss of a loved one requires a profound understanding of the bereavement process. After a death, most spouses suffer from some sort of depression; the key is recognizing when the depression is an extension of the grieving process and when it’s vital to seek professional assistance. Symptoms of depression are comparable to those mourning a spouse. Dr. Sidney Zisook from the Department of Psychiatry at the University of California-San Diego conducted a study showing that people who’ve suffered the loss of a loved one show many depressive symptoms after one month of the death. Furthermore, within the first month after the loss, 42 percent of people in this study displayed symptoms that qualify as those of “major depression.” Clinicians and patients in this study agreed that it’s normal to experience symptoms of depression in the bereavement process. A spouse's death is traumatic, and the devastation of the surviving partner manifests itself in many ways; some of these depressive symptoms may be emotionally and physically disabling. Mourning spouses complain of problems sleeping, decrease of appetite, dissatisfaction at work, isolation, strained relationships with family, friends and generally poor health. Experiencing these depressive episodes indicates a normal and necessary reaction to the loss. Although you may not have anticipated the duration or magnitude of these emotions, coming to terms with these feelings is healthy and a fundamental part of healing. Coping with your spouse’s death is crucial to your physical and mental health. It’s essential to grieve when you lose a loved one. There are effective ways in which you can release your pain--join a support group, find comfort in family and friends, take time for yourself and spend time doing something your passionate about, or seek the assistance of a professional therapist. Be patient with yourself--each person is different; there is no universal list or timeline for grief. 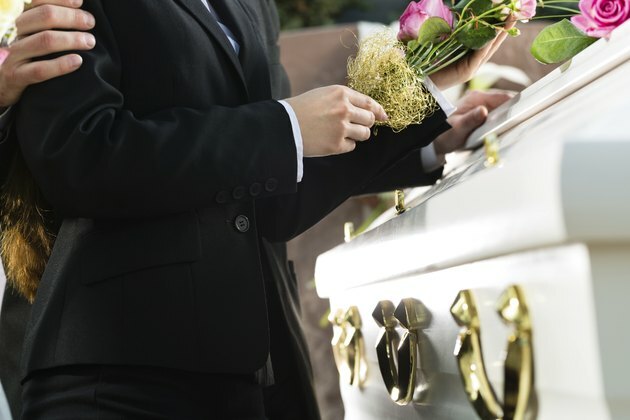 Suffering from brutal emotional shock may only be the beginning for some spouses; often, the death may lead to a financial crisis if the spouse who died was the main source of income. The loss of a spouse may require that the surviving partner start working, relocate and/or learn to parent alone. Death of a loved one impacts every aspect of your life on social, emotional and physical levels; take the appropriate amount of time to grieve before you make any drastic life changes. Suffering from the impact of this profound loss in your life is unbearable at times, and you will never stop missing the presence of your spouse in your life, but things will get easier and the pain will lessen as time passes. While indications of depression are normal in the bereavement process, if the symptoms worsen over time and if you or someone you love has spoken of or had thoughts of suicide, seek professional help immediately.